I know. What the world needs is not one more brownie recipe. I think perhaps finding a renewable energy source would rank above brownies…however I have the ingredients and the know how for brownies at my fingertips. How to harness wind power and sunlight and redirect their energy to power say my car or toaster is well beyond me and my abilities on a lazy Friday evening. 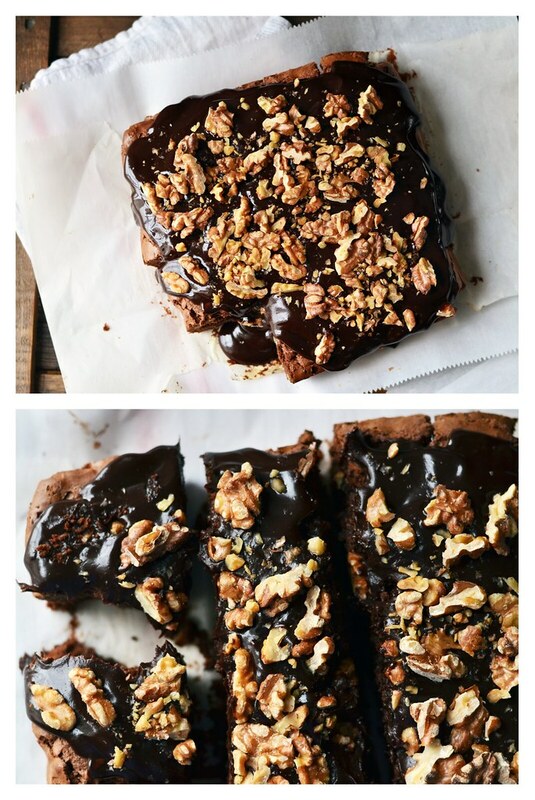 I demand a lot from a batch of brownies. There must be a thin crackly crust that gets stuck to your lips like a good piece of baklava or a flaky buttery croissant. The edges must be firm and a touch crunchy but with a good chew. The center fudgey and dense but with a noticeable crumb. 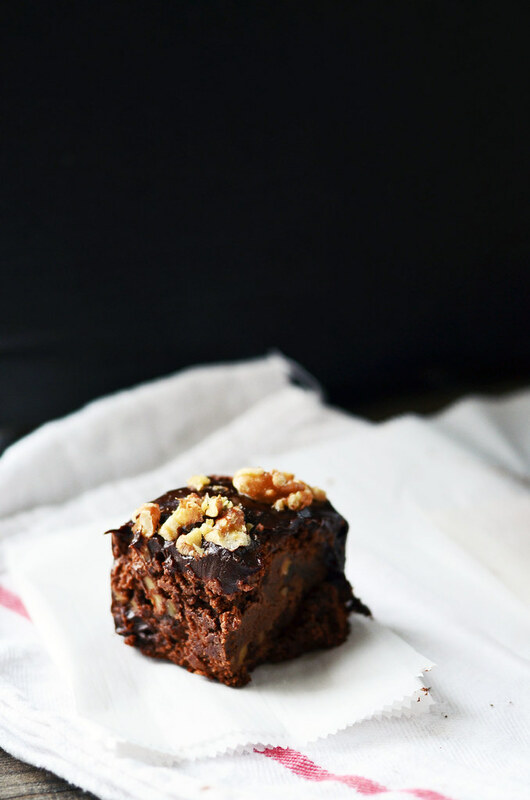 This brownie lives somewhere in the land between a slice of cake and a piece of fudge. But chewier. I am annoyingly specific when it comes to brownies. If a single bite doesn’t meet all these qualities, bite number two will not take place and I will pawn of the brownie to someone with lower standards. 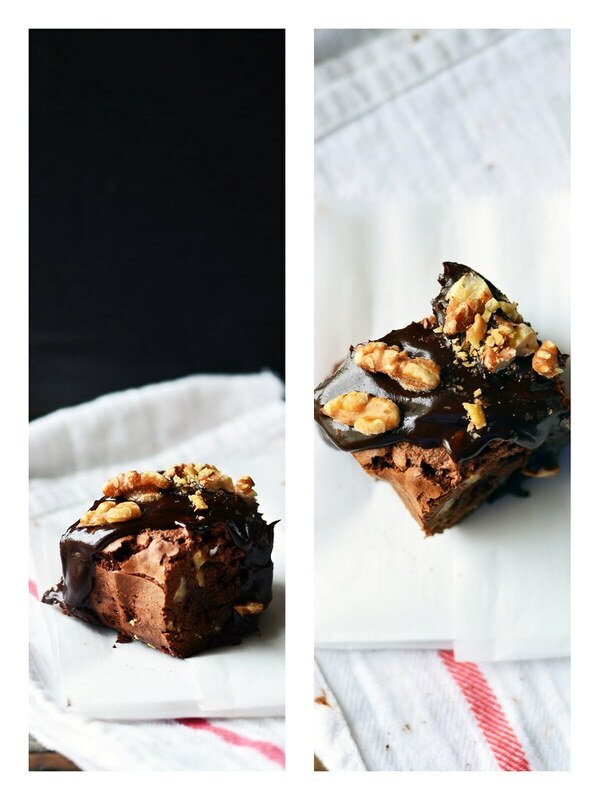 Brownie snob – I might be. I am just a girl who knows what she likes. And refuses to settle for anything less. This is merely in the scope of brownies. If only had this kind of handle on a broader range of topics I might have this whole adult thing under control. These brownies are based on the recipe from The Canal House and from an article found in Edible Columbus ( a quarterly magazine that is available in multiple other cities, including Cleveland). I will get to meet the amazing ladies behind The Canal House come the end of this month at The Big Harvest Potluck. To say I am excited would be a slight understatement as these women are living and creating like I can only dream of. Inspirations they are. And their brownies are damn good. It seems they have similar demands from chocolate and sugar and butter and flour. I just couldn’t wait to glaze before stealing a corner. The corner is absolute prime real estate on the brownie landscape. Preheat oven to 350F. Place walnuts on a baking sheet and roast for about 8 minutes until fragrant. Remove from oven and let sit until cool enough to chop. Roughly chop and set aside. Line a 9 inch square baking dish with parchment paper or grease with butter and dust with flour. Set aside. Melt butter in a medium saucepan over medium heat. Add sugar and stir to combine. Cook, stirring often, until mixture begins to bubble around the edges - about 3 minutes or so. Remove pan from heat and stir in both chocolates, espresso powder, and salt. Stir until chocolate is melted and mixture is smooth. In a large mixing bowl, beat eggs on medium speed until pale yellow and fluffy - about 3 minutes. Gradually add warm chocolate mixture to eggs at about ¼ cup at a time beating the whole time until the batter is smooth and all the chocolate mixture is added. Stir in the vanilla. 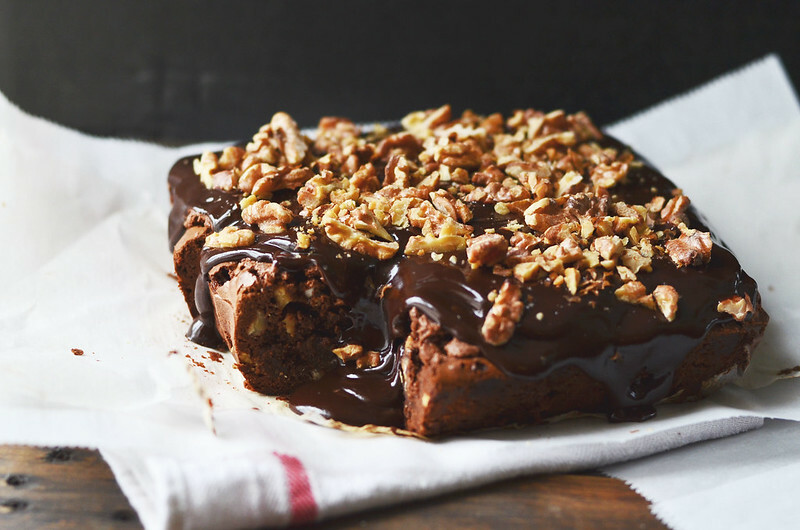 Using a rubber spatula or wooden spoon, fold in the flour and 1 cup roasted walnuts. Stir just until flour is combined. Do not over mix. Pour into prepared baking dish and place in preheated oven and bake brownies for about 45 to 50 minutes or until a toothpick inserted into the center comes out clean. Remove from oven and let cool completely before glazing. When brownies are cool - prepare glaze. In a medium sauce pan, combine heavy cream, corn syrup, and vanilla extract and place over medium heat. Bring mixture to a boil and then remove from heat and add chocolate. Let sit for 5 minutes and then stir until chocolate is melted and the glaze is smooth. Let glaze sit for about 10 minutes to cool and become a bit thicker. 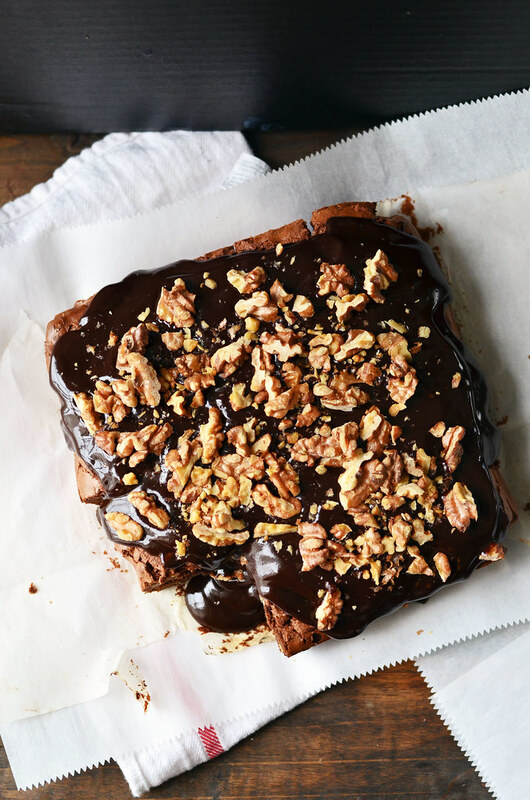 Place brownies on a wire rack that is sitting atop parchment paper. Evenly pour glaze over brownies using a knife to spread glaze if needed. Sprinkle glaze with remaining roasted walnuts. The glaze will harden as it cools and this process can be expedited by placing brownies in refrigerator for a few minutes.